With a wingspan as small as just under a half of an inch (12 mm), the Western Pygmy-Blue (Brephidium exilis, also known as B. exile) is the smallest butterfly in North America. 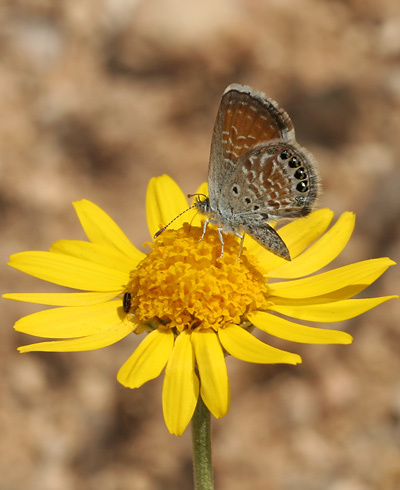 Western Pygmy-Blue butterflies are common here in southeastern Arizona, especially in the early fall, but they are not very conspicuous or easy to spot given their tiny size. Unlike many other butterflies in the Blues Subfamily (Polyommatinae), Western Pygmy-Blues are not blue in color and are instead varying shades of gray and brown. Western Pygmy-Blues have coppery brown dorsal wing surfaces and gray, shading to brown ventral wing surfaces with white dashes on both the ventral forewings and hindwings, four black dots near the base of the ventral hindwings, and an arc of black and silvery metallic dots along the far edge of the ventral hindwings. Their wings are narrowly to broadly fringed. 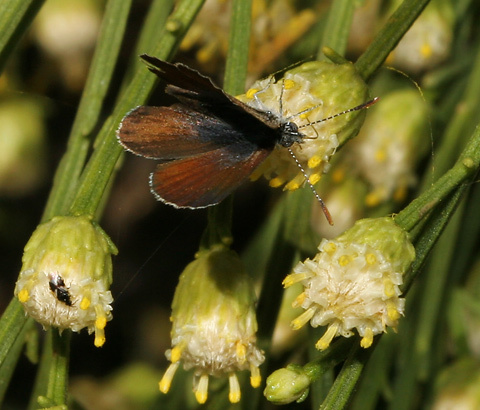 Adult Western Pygmy-Blues feed on flower nectar, while their caterpillars feed on plants like Fourwing Saltbush (Atriplex canescens) in the Goosefoot Family (Chenopodiaceae).